It’s BOOM time. Few days back, Tecno Mobile Uploaded an unboxing video of their latest device – Tecno Boom J7. I was awestruck with this pleasant Tecno move. The Tecno Boom J7 is the smartphone every human will like to have in their pocket. Tecno J7 appears to be the latest gadget from Tecno Mobile. This is a smartphone with high specifications that takes it all with many features that it shares, this device is regarded to be a close rival to the trending Infinix Hot Note if I may say so. I will focus more on an awesome and in-depth look at what this gadget (Tecno J7) possess, ranging from its price, full specifications, change it would bring to the android marketing and its availability in the Market. Doubtingly the biggest smartphone screen size you might have used is a 4” screen display. Am I Right? Tecno J7 present you a beautiful experience with its 5” HD screen display device. You don’t have to strain your eyes to see. It possess a screen resolution of 720 x 1280px which is considered a perfect screen resolution. The gadget has a dimension of 143mm ×71.9mm ×8.93mm. Smartphone users are now fond of selfie, and now camera specifications have become the most important bit of every smartphone. Gone are the days when people uses smart devices which barely had 2MP or 4MP back camera. It also houses a 2MP front camera front camera even though not up to that of the Infinix Hot Note but can better serve the purpose. 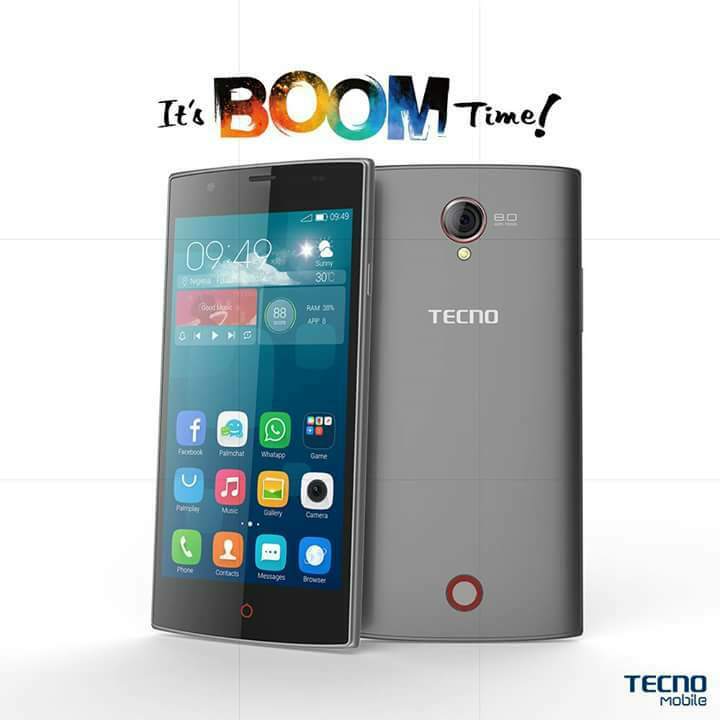 Installed in the Tecno Boom J7 is a powerful 1.3GHz Quad Core processor running on the Android 4.4.2 Kitkat. Though you might have been expecting this device to come running on the Android Lollipop as many other mobile companies has been introducing to its users. But, I bet you that the Android KitKat on this Boom J7 isn’t bad at all as some android smartphones in the market are expected to run on the KitKat version of Android OS smoothly. With the advancement of tech, people are now open to running different apps at a time. No one want small storage space on their device anymore. But thanks to TECNO. They have get you covered with an awesome storage space embedded in the Tecno Boom J7. It comes with a 16GB internal storage (ROM) and a 1GB RAM. Although the RAM is not up to the recent standards of probably 2GB or 3GB of RAM, but this device has the power to run your applications smoothly and without problem. Apart from the camera angle, the battery is another essential part of every smart device. You need to pay close attention to the battery capacity. You don’t expect an android phones to run perfectly on a low capacity battery like 1500mAh. The Tecno Boom J7 has been given a 2020mAh battery capacity. This is not the best neither is it the worst. With this we hope the phone has employed some battery saving tips and also little background activities. Anyway better phones have a battery capacity of up to 3500mAh. The Tecno Boom J7 price is ₦26,000 – ₦30,000. The device is now available. Tecno J7 is the smartphone every human will like to have in their pocket. Tecno Boom J7 appears to be the latest gadget from Tecno Mobile. Comment…pls we need update for tecno boom j7 urgently please………!!!! This is a beautiful phone inside and outside! Go tecno, go tecno, go! Thank God for this techno J7 I pray to buy it for my birthday next month. Techno is one of the best. phone in the market of today and thanks for techno. ALWAYS TECNO IS FOR ALL PEOPLE. Tecno is sapping us too deep, imagine Infinix hot Note x551 with better spec selling for N23,500 while TecnoBoom with lesser spec sales for N28,000. Infinix has 4000 battery life, 6892 mediatek with 450mp4 chipset, etc over tecno yet cheaper. Pls l wana buy a tecno android phone. Which among tecno j7 an c5 shld l go for. I want one with speed and stable Internet service.